* This course focuses on the Zynq-7000 All Programmable SoC and 7 series FPGA architectures. Check with your local Authorized Training Provider for the specifics of the in-class lab board or other customizations. Introduction to High-Level Synthesis – Overview of the High-level Synthesis (HLS), Vivado HLS tool flow, and the verification advantage. Basics of the Vivado HLS Tool – Explore the basics of high-level synthesis and the Vivado HLS tool. Design Exploration with Directives – Explore different optimization techniques that can improve the design performance. Vivado HLS Tool Command Line Interface – Describes the Vivado HLS tool flow in command prompt mode. Introduction to HLS UltraFast Design Methodology – Introduces the methodology guidelines covered in this course and the HLS UltraFast Design Methodology steps. Introduction to I/O Interfaces – Explains interfaces such as block-level and port-level protocols abstracted by the Vivado HLS tool from the C design. Block-Level Protocols: Explains the different types of block-level protocols abstracted by the Vivado HLS tool. Port-Level Protocols: Describes the port-level interface protocols abstracted by the Vivado HLS tool from the C design. Port-Level Protocols: AXI4 Interfaces – Explains the different AXI interfaces (such as AXI4-Master, AXI4-Lite (Slave) and AXI4-Stream) supported by the Vivado HLS tool. Port-Level Protocols: Memory Interfaces – Describes the Memory Interface port-level protocols (such as BRAM, FIFO) abstracted by the Vivado HLS tool from the C design. Port-Level Protocols: Bus Protocol – Explains the bus protocol supported by the Vivado HLS tool. Pipeline for Performance: PIPELINE – Describes the PIPELINE directive for improving the throughput of a design. Pipeline for Performance: DATAFLOW – Describes the DATAFLOW directive for improving the throughput of a design by pipelining the functions to executes as soon as possible. Optimizing Structures for Performance – Learn the performance limitations caused by arrays in your design. You will also learn some optimization techniques to handle arrays for improving performance. Data Pack and Data Dependencies – Learn how to use DATA_PACK and DEPENDENCE directives to overcome the limitations caused by structures and loops in the design. Vivado HLS Tool Default Behavior: Latency – Describes the default behavior of the Vivado HLS tool on latency and throughput. Reduce Latency – Describes how to optimize the C design to improve latency. Improving Area – Describes different methods for improving resource utilization and explains how some of the directives have impact on the area utilization. 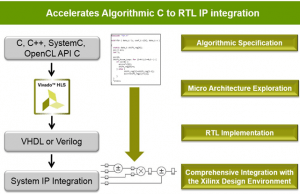 Introduction to HLx Design Flow – Describes the traditional RTL flow versus the Vivado HLx design flow. HLS vs. SDSoC Development Environment Flow – Describes the HLS flow versus the SDSoC™ development environment flow. Vivado HLS Tool: C Code – Describes the Vivado HLS tool support for the C/C++ languages, as well as arbitrary precision data types. Hardware Modeling – Explains hardware modeling with streaming data types and shift register implementation using the ap_shift_reg class. OpenCV Libraries – Explains the OpenCV design flow and the Vivado HLS tool support. Pointers – Explains the use of pointers in the design and workarounds for some of the limitations.